shocked the hell out of me, I thought they'd take a safety. Love the pick but sadly I think they'll try and pass him off as the offensive playmaker fans have wanted. Honestly. I hate to be a downer here, but he won't help us right away. This team is a joke. The Cowboys are still WAY better than us. 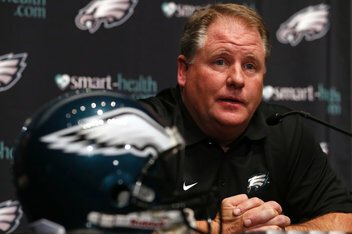 We could've kept our 2nd round pick and still got Desean and stayed at 19 and got Kenny Phillips even or Merling, Otah. I didn't want Otah if it meant no WR, but in hindsight it makes sense. he's the next steve smith. You're a joke. Are you serious? Did you read what you wrote? The return game got a lot better today at the very least. At #49, this is a farging great pick. He is exactly what the Eagles need. Could they use a Roy Williams or Chad Johnson? Sure. But Jackson can do a lot of things that no one on the Eagles can do. Are you serious? If befored the draft I said our first two picks would be DeSean Jackson and Trevor Laws everyone would be fine with that. We not only did that but we added a 1 in '09 and Booker. Merling is not a fit here, we already have a guy like him in Abiamiri. Phillips would've been a wasted pick at 19. Excellent draft so far. don't be such a killjoy. we still have three 4th's and four 6th's to look forward to. who needs 1 really good player when you can have 7 mediocre players? Desean Jackson will have an immediate impact.. atleast in the return game... that's more that can be said for most rookie wideouts. I feel like we could've done a lot better. My gripe is what did we do to catch the Cowboys and the Giants? This was the only team that didn't make the playoffs last year. The taterskins, Giants, Cowboys all took players who will play immediately. Laws is a rotation guy, and Jackson isn't starting at WR any time soon. So in the grand scheme of things, where are we right now as a team? You are forgetting a healthy McNabb, one of the only 3 CB deep secondary, and an upcoming pass-rushing specialist. Add in a 3rd DT and a speedy return threat....the birds are MUCH better. I agree with better. Not much better. We are still lacking some major weapons on offense. Jackson won't step in right away. He'll step in right away as a returner....look at what Hester did for the Bears. I truly think the defense will be better with Samual & Clemons. I think the offense is better with Kris Wilson, a healthy LJ, and Booker - not to mention a healthy McNabb and hopefully a more productive OL. The Eagles lost 5 games by 4 points or less. Better field position or a few more turnovers makes the Eagles a playoff team last year...and that's with all of McNabb's struggle. Don't be so gloomy guss. Name another team with 3 starting CBs....2 of which are Pro-Browlers.